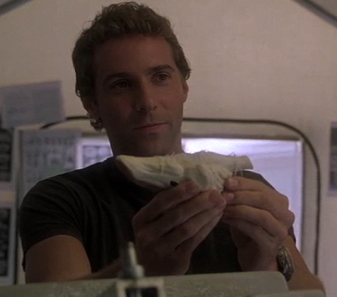 Billy Brennan was Dr. Alan Grant’s assistant on paleontological digs, and was quite knowledgeable about computers and other forms of technology, much to the dismay of the “mechanically impaired” Grant and showed him a rapid prototype machine which was used to make a cast of a Velociraptor’s resonating chamber. Billy accompanied Grant to Isla Sorna, primarily because Grant didn’t want to be alone with complete strangers. On the way to Isla Sorna, Billy told Grant a story about how he and some of his friends had once gone hang-gliding in New Zealand, and an updraft swept him against a cliff. He had been saved by the strap of his camera bag, which since then was his “lucky” strap. On Isla Sorna, Billy took pictures with his Nikon F100 camera, such as one of the footprint of the Spinosaurus and other images in the embryonics facility. At the same time, though, he rather foolishly decided to take two Velociraptor eggs from their nests with the intent of selling them to fund his and Grant’s digs, since the exponentially large check that Paul had promised them turned out to be bogus. Because of this, the group was soon relentlessly pursued by the pack to which the eggs belonged, ultimately leading to Udesky’s death. When Dr. Grant learned about what Billy had done, he claimed that he (Billy) was no better than the people who had built Jurassic Park in the first place. However, Billy redeemed himself, at least in Grant’s eyes, when he rescued Eric Kirby from the Pteranodons, risking life and limb as he did so. 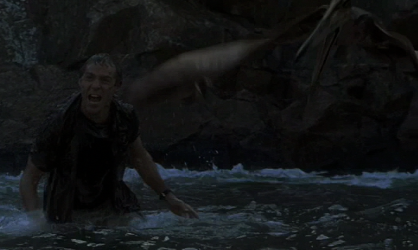 After falling into the river that ran through the Aviary, Billy was viciously attacked by the Pteranodons, though survived and was rescued by the military who came to Isla Sorna. He also recovered Grant’s lost hat, which he returned to his grateful mentor. Billy Brennan was played by Alesandro Nivola.